One of the all time great Americans passed away Friday. Walter Cronkite died at the age of 92. I remember his final newscast in 1981, but forever etched in my mind is the night my grandparents let me stay up to watch the moon landing coverage. 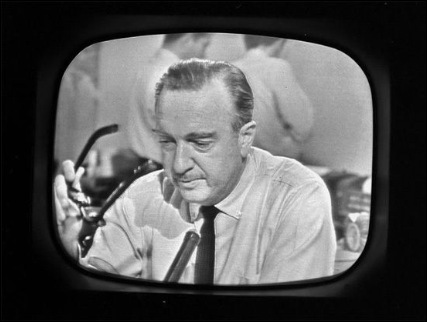 I’ll never forget the moment when Mr. Cronkite told this little wide-eyed spacenerd kid that men had just landed on the moon. I don’t mean to take anything away from those who loved the music and dancing and charity work of Michael Jackson, but Walter Cronkite had a far greater and deeper influence on the American psyche, and it seems a shame that Cronkite’s passing won’t merit the same attention span of Jackson’s death. But perhaps that’s a good thing – Uncle Walter would have loathed the circus. Previous Post: Take yer stinkin paws off me, you damn dirty ape!